This post contains affiliate links. If you click the link make a purchase, I will receive a small commission at no extra cost to you. If you’ve never had a deep fried turkey for Thanksgiving, you just don’t know what you’re missing. Mom and dad have been deep frying their holiday bird for decades. Actually, the first time I tasted this moist, crusty well-seasoned delight was at their house. And I’ve been on the bandwagon for several years now. The fried turkey not only tastes better than baked (in my humble opinion) but frying it also frees up my ovens and my time since the turkey fries so quickly. Mom’s Deep Fried Turkey Rub seasons the turkey perfectly. My parents fry their bird outside using their propane-fueled deep fryer. I did that for a few years until I found an indoor electric deep fryer and I love it. It’s just an easier clean up for me. 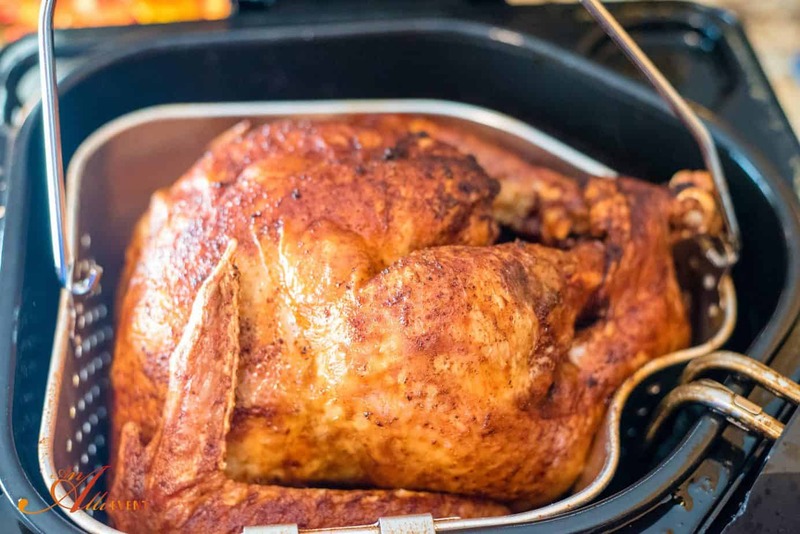 Click here to find the turkey fryer I use. When our first grandchild was born, we had to stop the tradition of driving 6 hours to my parent’s house for Thanksgiving. That way my grandkids can spend part of the day with us and part of it with their other grandparents. We now make a trip between Thanksgiving and Christmas. It’s all good! As my mind races toward Thanksgiving and deep fried turkeys, I can’t help but think back to the older gentleman that owned a local restaurant in our area and attended our church. It was many years ago when he walked up to me a few weeks before Thanksgiving and told me he wanted to deep fry a turkey for me and deliver it to my home. As a well-mannered southerner, I mildly protested while secretly jumping up and down inside my head. And, for about five years he would show up at my front door a few minutes before dinner would be served. He wouldn’t come in. He just smiled, wished us a Happy Thanksgiving and was on his way. And that turkey was delicious! That kind man did that for about 5 years until he closed his restaurant. Isn’t that the sweetest thing in the world? Detour over. 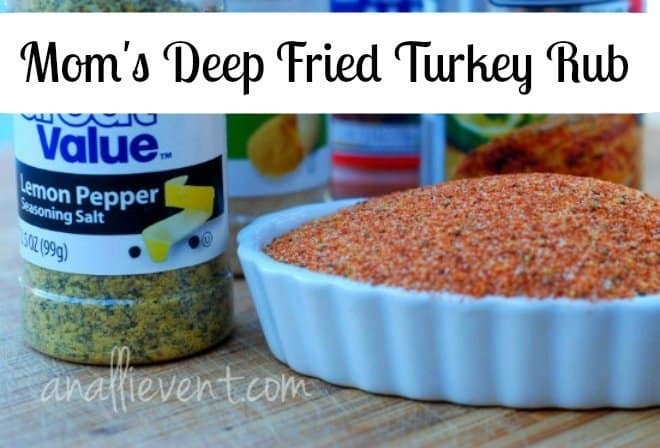 My mom makes the best rub for her deep-fried turkey and of course, I use it as well. I hope you try it. And please use extreme caution when deep frying. Helpful Hint: I use peanut oil for deep frying because of it’s great taste and high smoke point. I know it’s expensive because it takes a lot, but it’s worth it to me for this one day out of the entire year. Combine all ingredients and rub on turkey. It's best to rub the turkey the night before and let sit overnight in the fridge. But I've actually done it 30 minutes before frying and it was still good. Deep fry 3 minutes per pound at 325 degrees or according to your deep fryer. Enjoy! You may also like How to Deep Fry a Turkey. I show you exactly how I deep fry my turkey. 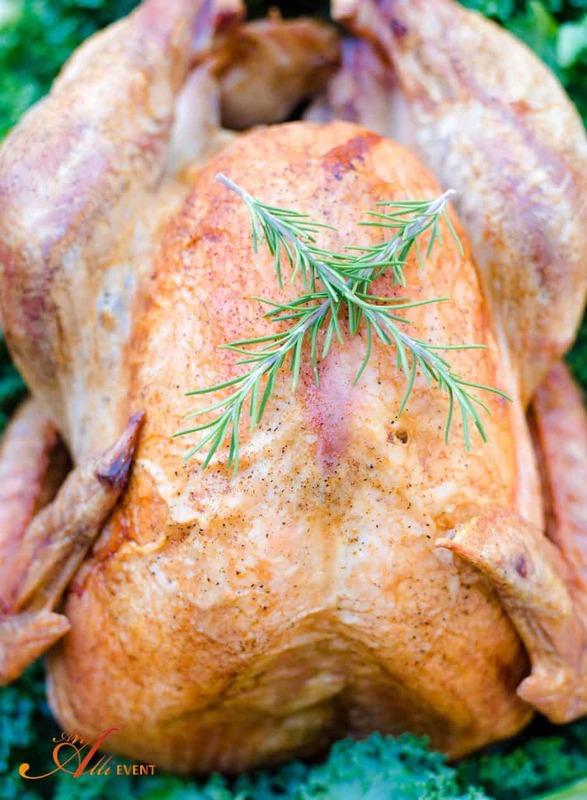 If you had rather roast that bird, I’ve got you covered on how to roast a turkey. Alli, this rub sounds wonderful! Once, we tried to deep fry a turkey at my sister-in-law’s house with an older, deep fryer outside. I’m not quite sure what happened, but a small bush nearby caught fire (so did the turkey!) It was an interesting holiday, lol! I’m going to keep this rub recipe handy in case we brave it again sometime! Thanks so much for sharing and have a wonderful day! I’ve heard horror stories of deep frying gone terribly wrong. That’s one of the reasons I use an electric turkey fried inside. I bet it was an interesting holiday. What a wonderful story! Thanks for sharing that, it is great to hear about such kindness. We love deep fried turkey at our house too. I’ve thought of getting a deep frier a few times over the years, just so we could do turkey that way. I’ve only had it once, but it was the most delicious bird I’ve ever tasted. I had never been a big fan of turkey until I had it deep fried and I rarely deep fry anything. Of course, I bake a ham, too. I had deep fried turkey once and it was excellent! Your rub sounds wonderful and what a sweet story about the restaurant owner. Have a wonderful Thanksgiving Alli! Hope your Thanksgiving Day is wonderful, Doreen! My mom and mom–in-law cook the turkeys. We do 2 Thanksgivings every year. My mom in the oven; my mom in law in a turkey roaster. I’ve never had deep-fried turkey, but I would love to try one sometime! The rub sounds great! Alli, I have a butterball indoor fryer and let me say, It’s the way to go… Besides, when I’m not frying in it, I can boil in it or steam in it also. Love it! That’s the one I have, too! Love it! Happy Thanksgiving. We just had one amazing turkey due to this rub recipe. Was a big hit at the family dinner. Thank you. I’m so glad! Comments like this one really make my day! Have a great weekend. Yum! That sounds (and looks like) a really delicious recipe. I’m going to give it a go next holidays for sure. I’ve never deep fried a turkey before and I’m wondering if you just use the rub or do you inject it with something as well? I just want to make sure I do this right. No need to inject it! The rub gives it plenty of flavor and deep frying it keeps it moist and tender. Thank you! It was absolutely delicious. My family loved it and we plan on using this recipe for years to come. I say yes! I think it would work perfectly. It’s not too spicy for our family. None of the children have ever complained about it being too spicy. You could omit the cayenne pepper if you’d like.